Learn what to look out for on French peages, with a real-life “what not to do” example, and travel the tollways stress and hassle free. 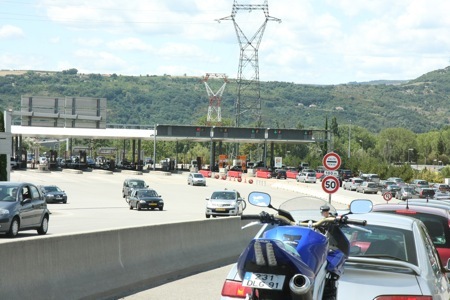 I just don’t know what it is about the peages (payment points) on French tollways. Despite my own extensive travel experience, they still make me nervous! I’ll ask Kate to have 3 different credit cards, cash or the tickets ready 2km before we arrive. If they aren’t out and ready to go, I get increasingly nervous and a little crazy. The peages can have a lot of traffic screaming towards a limited number of gates and if you’re accustomed to the process, it can be crazy. Making it all even worse and potentially more stressful is the fact that the peages have a lot of cars going through them so if you make the wrong choice or something goes wrong, you’ll have a lot of people lined up behind you, very quickly. Imagine blocking a gate and trying to back up into the massive queue shown in the image below! This has happened to me, and trying to back the car (or campervan in my case) is diabolical. Reader Daniel R recently sent me an email about a costly mistake he made at the toll gates. 1) Most people don’t drive regularly with a high load so aren’t automatically on the lookout for such height restrictions. 3) There are often hundreds of (ok, approx. 20) lanes with only 2 or 3 actually open so you have to make quick decisions about where to point your car. 4) Like me, you’ll often be driving in a foreign country (I am from UK, but please don’t think all UK drivers are as stupid as me). If my tip can help 1 person save their bike/trip then I would be very happy. This is a horrible story (and Daniel doesn’t miss a chance to have a little stab at Cadel and Australia in general!) and I one I hope you’ll remember as you approach a peage in a campervan or with a bike on the roof. There are a few great websites with more detail about the Peages (start with autoroutes.fr). I cover French tollways in more detail in the Cycling In France guide as well as the Guide to Campervanning France. The French rolls can be confusing however always go for the cash gate it gives change too. France in general has parking gates etc that will take only foreign credit cards but not debit visa cards or their own prepayment cards.btw don’t even try getting a mobile chip if it they can make it hard they . Good tips. Definitely a credit card (or two) are a good idea (I mention this in my Cycling Through France guide). Goodness this made me laugh! Your timing is particularly impeccable! We dropped our camper back off in Spain a couple of days ago after somehow surviving three weeks in Pyrenees and elsewhere in the south of France with a very large camper (looked so much smaller in the website’s pictures). Those tollways! You’re so correct – you think you have them all worked out, and then the next one is totally different. We thought we were prepared to drive north from the Spanish border, direction: cycling heaven. Hubby had the glove-box stuffed with about 35 Euros in coins (“I mean, the Aussie tolls are like, 2 bucks, right?”), the appropriately highlighted sections of the phrasebook as well as a keen eye open for the death-to-camper-by-low-clearance-boom gates. We quickly worked out the hastiest method of parking, opening the camper’s door, jumping out and clambering back in to manage the coin and ticket slots (as the height of the driver’s window at our camper slotted in conveniently between the “high” one for the trucks and the “low” one for the cars) and setting back off. Following what seemed to be the 52nd €7.20 toll, we were getting low on 1 and 2 euro coins and pulled up at tollway (we’ll call it) #53. I leapt, skillfully, into my car door gymnastics routine and chucked in the 17 coins totalling Euro 4.20. Leapt back in the car. Clutch, shift, hand break, ready……..nothing. Back out. Read all markings on buttons and slots, cross-check with phrasebook. No idea. Non. Loooooong cue forming. Pressed the help button. Despite having prepared myself for precisely this sort of situation, I had been too scared-y to try to use any of my various credit cards at the unmanned stations just in case I never saw them again. Stuff it. (Me to hubby) “Chuck me the credit cards!!”. Sh!t (excuse my French). No slot that says “credit cards”. No slot for notes. I don’t have a “ticket”. Line from toll gate #53 to Spanish border. 17 coins got spat into the return tray, boom gate opened. I grabbed for the coins (heavens knows, there could have been another toll just up the road! ), dove back into the car (Hubby yelled, [panicked]) “GO!! GO!! GO! !” and sped away (relatively speaking; I was driving a 3-tonne Spanish Autocaravana). Next (and last!) toll gate thereafter – easy as! Was a “Take a ticket” job, then pay a real person at the other end. Oh, and now I know that the “Billet” translates into “bank note” as well as “ticket”. You live and learn.